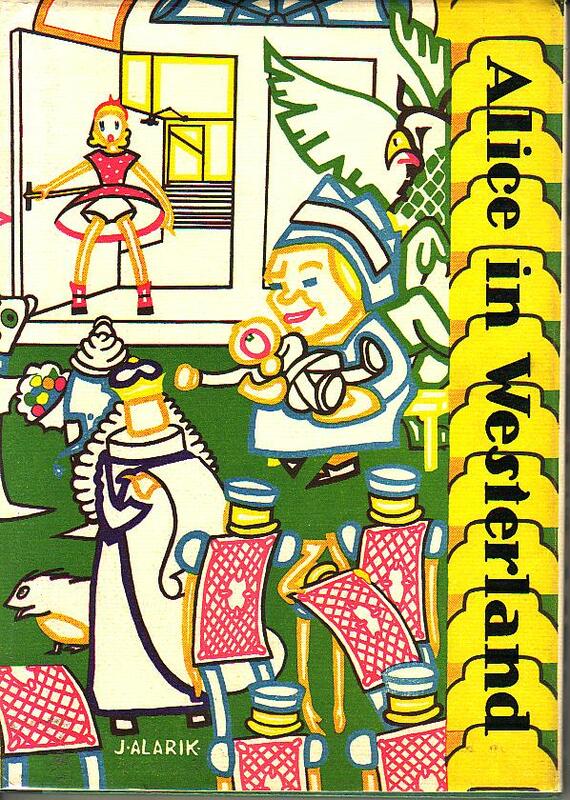 Alice in Westerland- editor in chief: Jim Kline; Co-editor: Ruth Cooperman. Illustrated by J. Alarik. Also has photos of the clubs mentioned and yearbook photos of everyone at the back. Published by West High Publishing Company, Minneapolis, 1932. Hardback with Dustjacket. 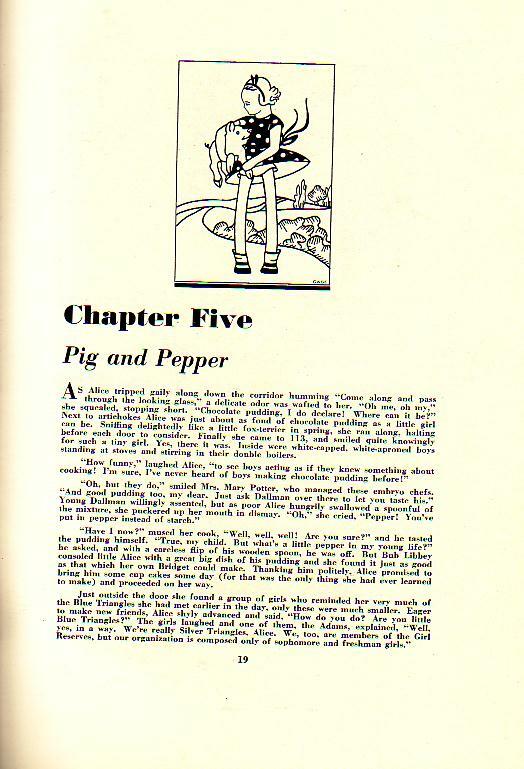 College yearbook with versions of both Alice books: Part One: Alice’s Adventures in Westerland and Part Two: Through the Looking Glass. The book includes details of various Glee Clubs, Sororities and Sports Clubs. It’s signed by some of the class members, with uniformly beautiful handwriting. Alice in Wonderland: Centenary Edition. 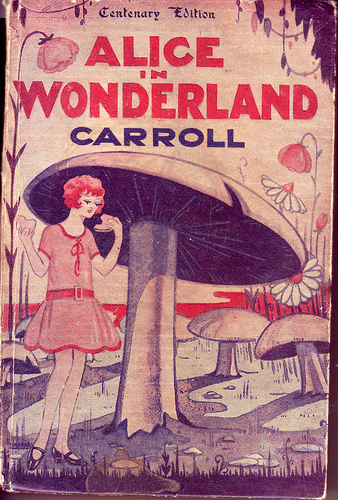 Original Lewis Carroll story. Lots of pictures here. Mine has a different cover, but the internal illustrations are the same. I like this rather 1930s Alice, she’s rather stylish. There’s an ad for Nestlé chocolate on the back cover: 2D for a big bar, apparently. Yum. I think this one came from mum: thanks! 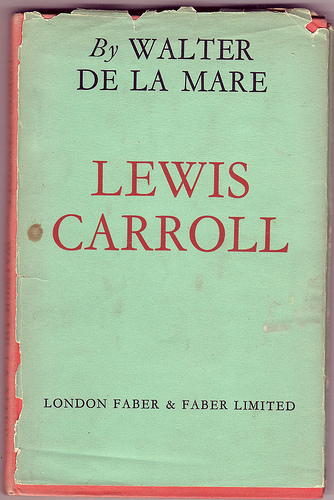 Lewis Carroll by Walter de la Mare. Published 1932 by Faber & Faber, London. 8vo. First edition. Orange clothbound hardback with gilt title on spine. Dustjacket in several pieces. A short study of Lewis Carroll by the famous English poet. My copy is pretty much completely knackered. No idea at all where this came from. I really should get myself a better copy, but there’s just so many more new things to buy… sigh.